Fed up with making breakfast for the kids? Send them off on their bikes on Lambeth and TfL's friendly roads this Thursday morning to the triangle in the middle of Kennington Park Road; Brixton (slip) Road and Camberwell New Road. City Hall are organising a Bike Breakfast next Thursday 27th at 8am, opposite Oval Station – there’s a triangular bit of land that it’ll be on. There’ll be free coffee and croissants, probably a Dr Bike too, to promote the London Assembly Transport Committees Cycling Report Launch. Cycling should be permitted on more routes across Tooting Common than the one currently allowed, in order to avoid busy roads. Some information on this follows; more is here. The forthcoming local elections give a chance to elect Councillors agreeable to this change, but there's also a chance to influence this right now as the Friends of Tooting Common are asking people to respond to a simple one-question survey. Please take one minute to fill in the survey answering the question with 'Other: Permit cycling on more paths across Tooting Commons'. Encourage others to do so too ( surveymonkey.com/s/SW5V2HQ ) so we can get this request into the Tooting Commons top three requests for Wandsworth monies. Yesterday a police sergeant for Graveney in Wandsworth tweeted about his enjoyable ride across Tooting Commons. I should imagine he was using the blue line on the map below, where cycling is permitted, to travel from Lambeth in the north to a part of Wandsworth in the south (the black line shows the borough boundary line, Wandsworth to the west; Lambeth to the east). If the sergeant had wanted to cycle from Emmanuel Road in Lambeth to Drewstead Road in Lambeth, following the red route, he would be in breach of signage banning cycling (I don't think anyone knows if bye-laws exist actually banning cycling here) and the police would be likely to be out enforcing it, as you will see has been happening on the southern end of the Common recently. This is despite the red routes in particular being hugely desirable, safe and perfectly reasonable routes for cyclists on wide sections of path (pics of the Lambeth to Lambeth section are here). At a recent Tooting Commons meeting the police stated that there have no serious injuries as a result of people cycling on the Commons. Subject: Policing and Wandsworth Council putting children’s lives at risk. Once again yesterday my wife was stopped by police while taking our 7 year old child to and from school, safely and sensibly by bicycle, on the generously proportioned path next to Tooting Athletics Track to avoid one of the busiest roads in south London. As I have outlined in previous correspondence, this action is endangering children’s lives by forcing them to negotiate with busy traffic and HGVs. The path is the same width and runs directly into another authorised cycle path that dissects Tooting Bec. It is used responsibly by hundreds of cyclist everyday without incident. The police have said that there have been complaints by dogwalkers about irresponsible cyclists. That is regrettable but this is a) a symptom of the lack of cycling provision on this path b) completely irrelevant to a responsible 44 year old woman taking her small child back and forth to school c) will not be solved by occasional strong arm tactics by local police. This is a waste of police time and tax payers money, and is turning responsible citizens into criminals. Furthermore I too would like to make complaints about dog walkers allowing their animals to foul the Furzedown streets and excessive speeding in the Thrale road area and would now therefore expect the relevent increase in police patrolling the area to deal with these problems. The lack of provision in Wandsworth and the demonising of cyclists is tantamount to a shameful cycling vendetta by local police and the council. Thank you for raising this matter. I am sorry you feel that your wife is "demonised and subject to a vendetta", which I assure you is not the case. Five other cyclists were also spoken in the same period your wife was stopped by the MPS Safer Parks Team. This is a clearly marked path and the signage is clear and shows it is an offence to ride a bike on this footpath. Your wife should dismount if this is the only route available to her. Those cyclists who comply with the law have nothing to be concerned about it is only those who contravene the law who will be reported and then it is a matter for the courts to decide any sanction. Wandsworth Council have no intention currently of making it dual use and therefore it remains an offence to ride on this path. This is a matter for the council. Enforcement action will continue across the borough in a proportionate and targeted way. Two thirds of the tickets under the ongoing MPS's OP Safeway have been given to vehicles while only a third have gone to cyclists. A big issue on Wandsworth has been the rise in those killed or seriously injured in collisions involving cycles - we are now working hard to reduce this and part of this is responding to those few cyclists who break the law. Dog fouling is matter for WBC's Dog Control unit outside of the Park - In the park the Safer Parks Team enforce with an even hand and have reported owners of dogs that foul, those that have dogs out of control and those that carry out licensing dog walking with excess numbers of dogs as well as those that do not have the correct fishing permits or those that cause criminal damage by fly tipping. Regarding your concerns regarding excess speed along Thrale Road, I would be grateful if you could assist me with any evidence of these offenders, such as time of day when it is prevalent so I can task our neighbourhood officers to counter this report of illegal activity. With regards the use of Police for such matters, the Met Police Safer Parks Team is funded by Wandsworth Council to police the byelaws in the parks and open spaces of Wandsworth. Thank you for contacting the Metropolitan Police. I am sorry you are unhappy with our activity but our enforcement will continue. I asserted that I thought that the lack of provision and the demonising of cyclists was tantamount to a vendetta against cyclists, not my wife. I'm not sure if she shares this opinion but I'm certain that she thinks the policing of this particular path, in the manner it is carried out at the moment, to be ludicrous. But I note your ironic quotation marks and I'm pleased that my efforts to try and ensure the safety of my children causes you amusement. Although this is guidance on the issuing of Fixed Penalty Notices, it clearly describes the situation my wife and indeed I find myself in on taking my child to school. You assert that those cyclists who "comply with the law have nothing to be concerned about", but if I take my 7 year old on one of the busiest roads in South London, I very much believe I have a lot to fear, hence why we cycle considerately on this pathway, which let's not forget, is the same generous width as the "authorised" cycle path it leads directly into and is used safely and respectfully by hundreds of cyclists every day. I have used this path morning and evening every day for the past 13 years and have caused no distress or disturbance to anyone. You assert that "Enforcement action will continue across the borough in a proportionate and targeted way" again, I ask, is stopping a woman and a small child cycling to school in a safe and considered way to avoid heavy traffic, proportional? And that "A big issue on Wandsworth has been the rise in those killed or seriously injured in collisions involving cycles - we are now working hard to reduce this" - again forcing small children and their parents onto busy roads seems an unusual way to do this. In the past I have been informed that there have been complaints about "aggressive" cyclists, but again, does my wife fit the description of this type of offender? The truth is, people will continue to use this path everyday, it defies logic not to do so. Why not concerntrate effort on making it safer for cyclist and pedestrians alike, rather than demonising people who are just trying to get on with their everyday lives? And frankly having officers chipping up once a month and threatening mothers taking their kids to school, will not effect someone who is an "aggressive" cyclist anyway, it's using a particularly badly aimed sledgehammer to crack a nut that doesn't actually need cracking in the first place. In my previous correspondence, I used the examples of dog fouling and speeding traffic, as I believe both of these issues cause more damage and pose more threat to the residents of the area, yet the police presence dealing with these issues and the police presence guarding this small strip of pathway are bizarrely disproportionate. You ask about the speeding on Thrale Road, and the time of day and evidence, the answer to that is simple, send an officer there any evening, but again, in 13 years, I haven't once seen that happen either. If, as you suggest, your particular section is funded by Wandsworth Council, then I would advise a better use of funds might be to improve cycling provision across the borough, rather than targetting beleaguered cyclists. I cycle everyday from Furzedown to Hammersmith and the chaotic, ill-advised, disjointed, cycle paths that I have to negotiate, are a disgrace. Thank you again for having the courtesy to respond, I hope my correspondence initiates a more common-sense approach for the Safer Parks team and council alike. 1. Key to Lambeth is the borough’s intention to have cycling as 20% of trips by 2020, with 15% by 2015. To achieve this, and make a fantastic place, the central tourist part of Lambeth must have as little motor traffic as possible, with motor traffic reduction across the whole area the absolute key. Lambeth, unlike Westminster, is not motor-centric and this should therefore be facilitated at the highest level by TfL as well as the borough. There is urgency needed to meet the cycling modal share targets so LCC’s priority ‘coarse grid’ measures needs to be expedited within months, not years. Lambeth’s policy is for 1 – 100 cycling, that a parent conveying a one year old; an eight year cycling to school; and a nonagenarian can all cycle in comfort and safety; feeble measures are unacceptable. 2. There must be frequent and excellent places to cross the Inner Ring Road. 3. The grid has to accord to the realities of how people behave. It needs to adopt the core Dutch cycling design principles: Direct, Comfortable, Safe, Attractive and Coherent. Directness and Coherence are not met by parts of the Lambeth part of the grid as it stands, largely I suspect because the Grid is envisioned by TfL to be a mix of ‘slower quietways and cycling superhighways’ with nothing in between. a) The majority of cyclists using Waterloo Bridge are likely to continue to use Waterloo Road as it is direct (a straight line) and comfortable (gentle gradient, whereas the ascent/descent from Upper Ground / Belvedere Road is steep and bendy). Should this not be the focus of the Grid? There is a time penalty for using Cornwall Road as against Waterloo Road and I question whether this can be shortened to make it sufficiently attractive to a large number of cyclists. The Cornwall Road option can undoubtedly work as a ‘slower quietway’, if the southbound access to it off Waterloo Bridge is super safe and the traffic light phasing at the Cut is hugely improved (or better lights removed due to filtered permeability removing through motor traffic in the Cut), but remains indirect. b) Crossing Westminster Bridge to or from the cycling superhighway on the northern side, will people really go round the houses to get to / from Elephant and Castle rather than the direct route of Westminster Bridge Road? c) Why is there a gap on Lambeth Road outside Geraldine Mary Harmsworth Park when it’s the obvious, direct route to the Cycling Superhighway (6?) and passes the front door of one of our National Museums? a) The riverside route being created to link the American Embassy and Vauxhall to the London Eye and Tate Modern. This has huge tourist potential and needs to be exceptionally family and visitor friendly. 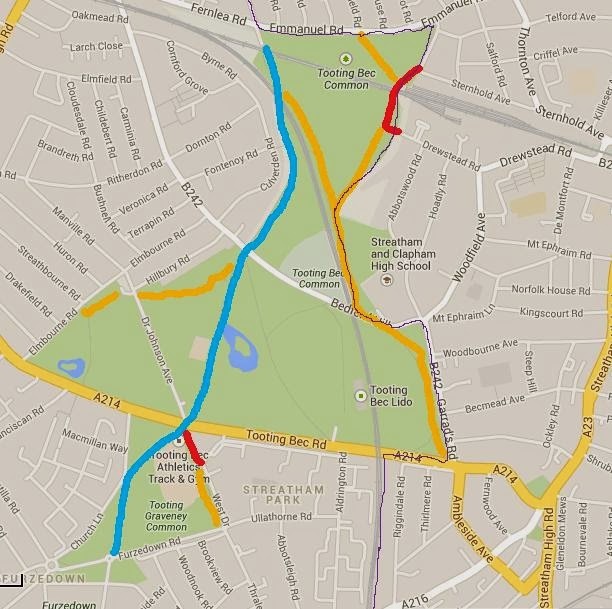 b) Kennington Road linking CS7 and the planned quietway through Kennington Park to Baylis Road and the Cut and beyond. The crossing of the Inner Ring Road needs to be made much more pleasant. The junction of Kennington Road and Lambeth Road lends itself to a scramble lights system. c) The Vauxhall, Nine Elms Battersea linear park linking through Vauxhall Walk to Hercules Road, Baylis Road, the Cut. Can this please all have motor vehicle access only rather than be a motor traffic through route (save buses as appropriate) or fantastic segregation if through traffic remains in part. A Dutch quality route between St Thomas’ and Guys Hospitals needs to be factored in. 5) I cannot stress enough the importance of the bridges and their junctions each end being made child cycle friendly within a short time scale. There is not a single child friendly bridge currently and this presents a huge obstacle to cycling journeys to school, shops and attractions across the river. I suggest tacking a ped’n footway addition to Waterloo Bridge on the east side, on the east side of the steps down to the Imax. This would allow the existing pavement to the west of the steps to be made into a mandatory, maybe segregated, cycle lane to the quietway exit, while retaining a bus and general traffic lane towards the roundabout. Through rearrangement of the lanes and bus stops at the northern end it should be a simple matter to allow an easy transition for children to Covent Garden from the South Bank complex and vis versa (Wellington Street and Bow Street in Westminster should have no motor traffic, save lorry deliveries at specific time slots). a) I question why Courtenay Street is highlighted rather than more direct Cardigan Street? b) a route from Reedworth Street through the car park of Cotton Gardens and across Kennington Lane (through relocating the adjacent Pelican and making it a Toucan) into Cottington Street and Othello Street to Kennington Park Road by Kennington tube station would be fairly easy and increase permeability of the inner ring road. Merlin Entertainments have a planning application for a new commercially-sensitive-so-undisclosed attraction to open at County Hall (already home to Merlin Entertainments existing London Eye and Aquarium, oh and the recently moved London Dungeon) which they expect to attract 600-700,000 visitor a year, whereas the Movieum it will replace attracts c50,000. The proposed new visitor attraction is predicted to generate an additional 3-4% of the existing visitor numbers. To the best of my knowledge no meaningful measures have been taken to make cycling better at County Hall (particularly the cycle route on Belvedere Road) with any of the previous developments. However, to the detriment of people on bikes, the large number of pedestrians on the river front has led to County Hall inhibiting cycling along the Thames Path. The application is number 13/06055/FUL on planning.lambeth.gov.uk and once you have signed in to the site you can comment. Feel free to cut and paste bits from my objection (publicly viewable) or from this blog, or if you're a planning expert, make comments on my blog for people to include in their objection. Below I detail the policy areas that I consider are not being engaged with in this application. The Transport Assessment, written by Atkins, for the new attraction confirms that the privately owned part of Belvedere Road behind County Hall is a cycle route - National Cycle Network route 4 as it happens. It is also a London Cycle Network route and a planned part of the Mayor's new central London cycle grid. The owners of County Hall choose to make it a difficult area to enter and exit, and recently tried to make it even worse than it is. They also provide no public cycle parking in their grounds. There is none on their section of Belvedere Road and none on Forum Magnum Square. 4.15. Cycle parking stands are provided to the south of the concourse area of the London Eye located adjacent to Belvedere Road as well as numerous other locations around County Hall. In addition, cycle parking is also provided at Waterloo Tube Station a seven minute walk from the new visitor attraction and also adjacent to Royal Festival Hall on Belvedere Road a five minute walk from the site. 8.10. No additional cycle parking is proposed as part of this planning application. The absence of cycle parking within the grounds of County Hall is glossed over and nothing is said at all about the dreadful quality of the cycle route access / egress at County Hall, nor are any measures proposed to improve it.  focus significant development in locations which are or can be made sustainable. In my view, no improvements to a poor quality cycle route coupled with no more cycle parking seems to fly in the face of that.  consider the needs of people with disabilities by all modes of transport. I would suggest that the transition from the road to the cycle path here exemplifies pedestrian / cyclist conflict and street clutter.  New developments should provide cycle parking and cycle changing facilities to encourage more cycling. Cycle parking provided for staff should be suitable for long stay parking. Quite clearly the cycle route access and egress at County Hall falls far short of world leading infrastructure, as does an absence of public cycle parking on the site. The Transport Consultancy fails to cite Lambeth's Cycling Strategy 2013, with its target of 20% of trips by cycle by 2020, and the demand for partnership working to achieve this. I would suggest that the application shows a distinct disinterest in helping achieve this. Last night, at the invitation of a vocal Harleyford Road resident, I attended a meeting between a handful of residents and Transport for London about Cycling Superhighway 5 between New Cross Gate and Victoria via Vauxhall Bridge. 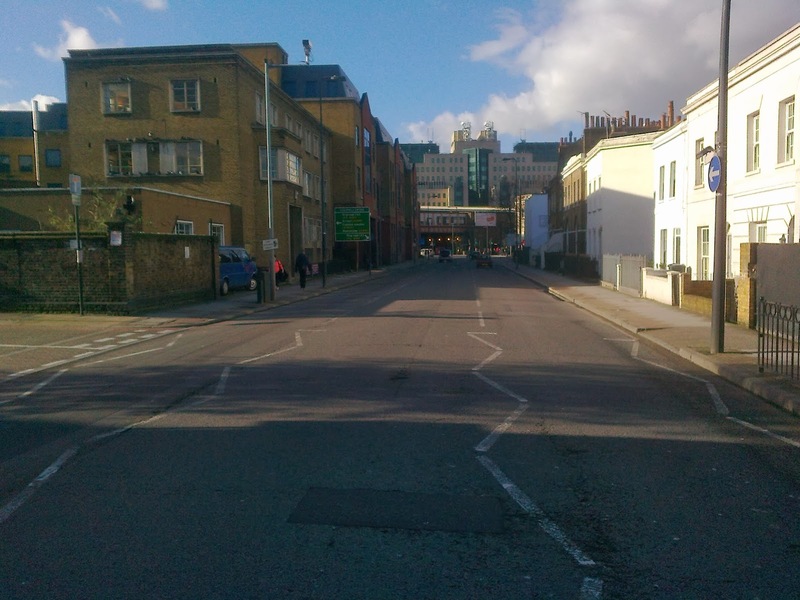 TfL proposes to turn one of the three lanes of one-way motor traffic on Harleyford Road, between the Vauxhall end of the cricket ground and the Royal Vauxhall Tavern, into a two-way cycling track. A number of properties face onto the road and some residents have concerns about the proposed track. The meeting was for Transport for London to present their current plans following a previous meeting about a year ago. Members of the Cycling Superhighway design and consultation team were there, and, lest there be any doubt that TfL are taking this seriously, Andrew Gilligan, the Mayor’s Cycling Commissioner, and Nigel Hardy, TfL’s Head of Capital Development came to meet the half-dozen residents. For those who don’t know the area, Harleyford Road is a TfL controlled strategic ‘red-route’ that runs up from the Oval towards Vauxhall Bridge. 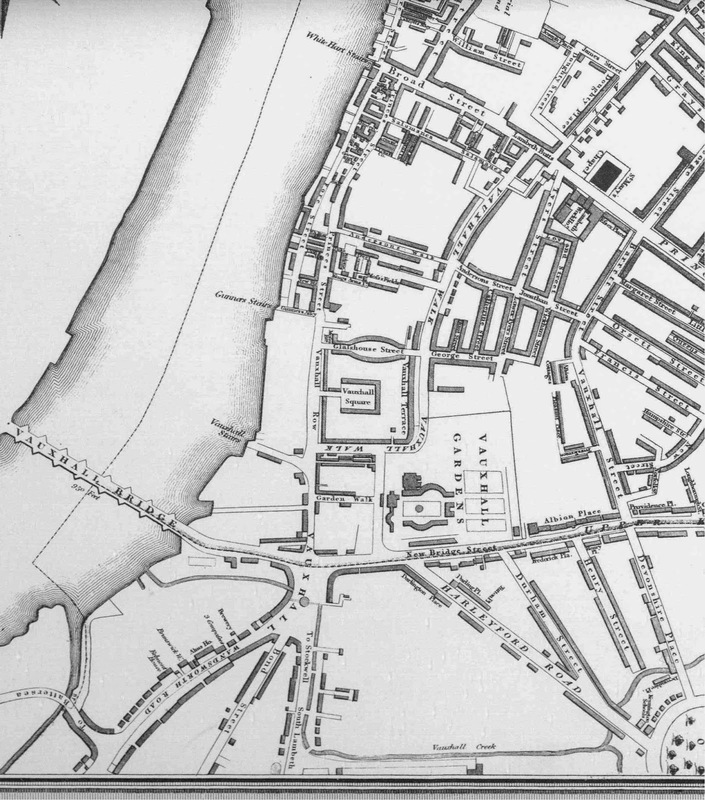 As this map, from this great resource, of 1831 shows, it has been a major road carrying people and goods between south and north London since the first Vauxhall Bridge was built in 1812. In Victorian times I imagine it was frequently congested; noisy due to the clatter of horse shoes and rumble of wagon wheels; liberally splattered in horse poo and pee. The coming of the motor vehicle, which could do in one trip what it previously too six horses and carts to do, may have seemed a huge relief to the residents at that time. As time went by however motor vehicle numbers and trips soared resulting in the noisy, polluted, race track that is Vauxhall as we know it today. The meeting was shouty and jumped around from topic to topic quite erratically, but I will try to capture the points that were discussed and some comments and suggestions I have. It’s pertinent to note that all the residents present seemed to live on the side of the road on which the cycle track is proposed to be placed (the right hand lane in the photo above, heading towards Vauxhall). One stated that she is a fair-weather cyclist. Loading and Unloading – At present the red-route status means that, according to a resident, you cannot load/unload between 7am and 7pm Monday to Saturday. The concern is access to hearses, ambulances, refuse trucks, fire engines, supermarket delivery vehicles, cars used by the infirm and removal lorries during those hours if one of three motor traffic lanes has been replaced by a two-way cycle lane. TfL pointed out that the existing loading bays that have been provided for most loading/unloading in Durham Street would remain. I pointed out even if vehicles stopped in one lane that would still leave a motor traffic lane available going in the same direction for motor vehicles to use. I also suggested that an off-peak loading bay on Harleyford Road would be worthy of consideration by TfL, which they took on board as a proposal. I took this photo in the early afternoon today and you can see that there is no shortage of space despite a broken down car. A further concern was the ability of people to cross a low barrier between the road and cycle lane that will prevent drivers from parking on the cycle lane. I suggested some wheelchair width gaps – insufficient to get a vehicle into – would permit this. TfL seemed happy to explore this. An additional issue was that people loading/unloading on this road (rather than in the Durham Street bay provided) would have to cross a two-way cycle lane to reach the vehicle. Apparently cyclists travel at 30mph (and presumably are impervious to injury in a collision as well as being beyond Olympic racing status) so that would present great difficulties. A TfL observation that the peak hour tidal flow tended to be in one-direction appeared to be lost in the general hubbub. The problems that would arise in the future from two-way cycling in the future were felt likely to be the same as the current ones, where people ride their cycles against the traffic on the pavement, the difference being that they would be riding on a separate track instead of the pavement. Pedestrian/Cyclist Interaction – Some people are rushing from A to C, through B where some locals are pootling around. Regardless of form of transport there can be conflict in this circumstance and excellent design plays a massive role in reducing this. The underlying issue in Vauxhall is how to successfully balance the needs of a transport ‘corridor’ with a place where people live. We must not end up with barren streets as exemplified a little further down Harleyford Road by the sullen wall along the Oval cricket ground. TfL’s urban designers have done good work in producing the draft Nine Elms cycling strategy, but there was no indication in the plans presented last night of place-making being considered here. For example, could trees be used at places to mark the divide between the road and the cycle lane, and could a more harmonious colour than blue be used for the lane. Ultimately, can the movement of goods and people be so improved that Harleyford Road can become a quiet, pleasant, safe and spacious boulevard through which thousands of people move? Inconsiderate road users, regardless of their transport mode, need to be encouraged to behave differently. Design plays a huge part in this, but so does education. I hope that local primary schools St Anne’s and Wyvil will be offering cycle training, which addresses this, to their pupils this year in preparation for the gradual introduction of their new routes to school. Access to Driveways – There are a handful of permitted driveways and residents are concerned about accessing or leaving them given a segregated cycle lane to cross. TfL said that access would be maintained. Some residents felt it was most unlikely that there would be a gap in the flow of people riding bicycles sufficient to allow them to turn into or out of their drive and asked for proof in the form of an existing example. 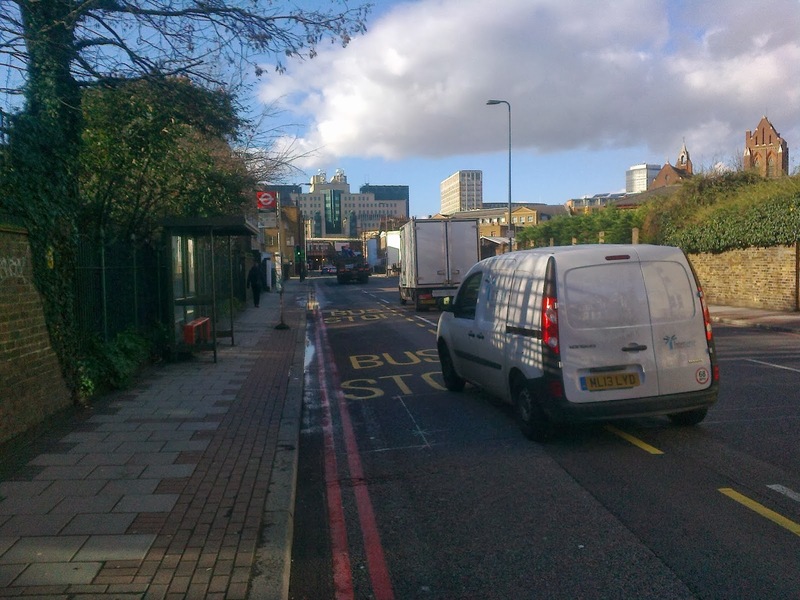 TfL cited Cable Street which has had such a cycle lane for over a decade. Putting out Rubbish – I don’t know where residents are currently required to put their bins out for collection. I presume on the pavement. The pavement will remain in place, albeit with fewer people riding bikes on it. Anyway, it’s a concern that TfL and Lambeth will need to ensure is checked out. Air Pollution – It was argued that providing dedicated space for people to ride bikes may increase air pollution because where there were three lanes of motor traffic there will now be only two. 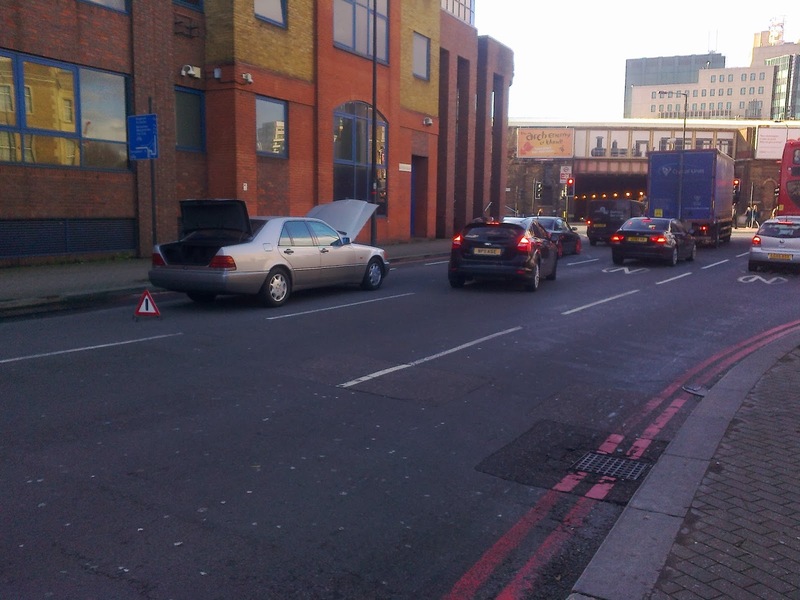 TfL said that traffic light phasing would be used to manage this. No benefits of more people cycling rather than driving or being driven and the knock on reduction in air pollution were raised. Banned right turn from Harleyford Road to Kennington Lane – a small number of drivers currently make this right turn. To facilitate the efficient, direct and safe passage of the existing and forecast number of people riding bicycles, TfL propose that the few motorists make this small part of their journey around the existing gyratory. I think that it was to do with this point that a resident suggested it would be a better idea here to maintain the right turn for the few and a good idea if the thousands of people riding bikes dismounted and walked their bikes across the road. Residents last night didn’t cite any potential benefits such as cleaner air; the motor traffic being further away from their front door reducing noise and serious collision danger; a fitter population reducing their NHS liability; or enhanced mobility options for adults and children in the houses thanks to a child-usable cycle lane outside the front door. It seemed unlikely that any of the owners expect a cycle lane replacing a lane of motor traffic will increase the value of the houses. Change can be threatening and it is easy to anticipate real or imaginary problems and focus on these. This is not to say that the matters that residents raised were trivial and of no matter. Some are real concerns and, especially at this early stage of London ‘going Dutch’, they need to be heard and responded to. A particular concern of mine is that cycle lanes do not become loading bays like the one outside Tesco on the gyratory, and so sensible loading/unloading provision needs to be designed in from the outset. Change is achieved incrementally – a cycling superhighway here is likely to be a step towards a much better future both for residents and for those who pass through. I am gratified that the residents are questioning the process and that Transport for London at a senior level are engaging with them. I look forward to seeing pensioners and primary school children riding through Vauxhall alongside the ladies and gentlemen who commute to work.